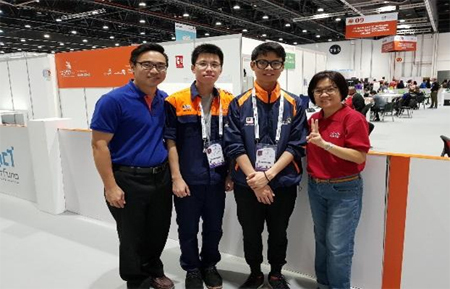 TAR UC students at the WorldSkills Competition 2017 (from left to right): Mr Liaw Chun Voon, Programme Leader, Department of Information and Communication Technology, Jeffrey Ting Ming Yeong, Teoh Jia Jun and Ms Chok Len Mooi, Deputy Dean of the Faculty of Computing and Information Technology. The Medallion For Excellence which Teoh Jia Jun won. 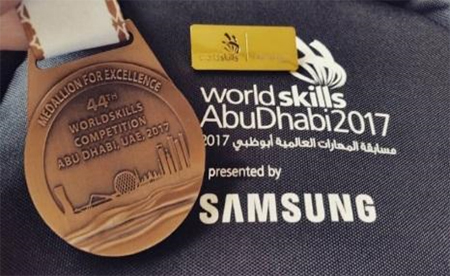 Recently Malaysia was under the limelight on global stage thanks to TAR UC student who won a Medallion for Excellence in the Web Design and Development category at the 44th WorldSkills Competition, an international level competition which was held in Abu Dhabi, United Arab Emirates from 15 – 18 October 2017. Teoh Jia Jun from TAR UC became the first Malaysian to win an award in the Web Design and Development category of the said competition which is an outstanding honour for Malaysia as well as TAR UC. The competition saw participations from close to 60 countries competing in 51 categories where Web Design and Development was one of the categories. Jia Jun who is studying the Bachelor of Information Technology (Hons) in Information Security was grateful for his achievement and the experience he gained from his participation in the international level competition. “I have competed in a number of national and regional level competitions such as the OpenIT Competition and ASEANSkills Competition but the experience I gained from my participation in the WorldSkills Competition is at a whole new level as I had to compete with students from various countries. I am so fortunate that I was given the opportunity to compete in this competition as I was able to mingle with other students from different backgrounds who are studying what I am studying. It is a great exposure to be able to learn about advancement in Web Design and Development in other countries,” he opined. Jeffrey Ting Ming Yeong is another student who competed in the IT Network Systems Administration category. Jeffrey is also a student of the Bachelor of Information Technology (Hons) in Information Security. Due to Jia Jun and Jeffrey’s outstanding performance in national and regional level competitions, both of them were selected by Jabatan Pembangunan Kemahiran (‘JPK’) under the Ministry of Human Resources to represent Malaysia in the WorldSkills Competition 2017.